So I am kind of obsessed with Cadbury Creme Eggs. They just taste so darn good and come Easter time I head straight for the store to get my yearly fix! Now that I'm older and wiser slightly more health conscious I limit myself to one bag of creme eggs only. As you know, I love doing themed/inspired/festive manicures and I have wanted to do a manicure inspired by my favourite Easter eggs since I started my blog. The problem was I always ate them all before I could do my mani! 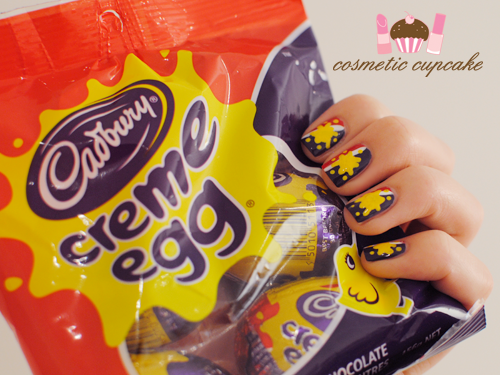 This year I restrained myself so here is my Cadbury Creme Egg manicure for you all! Apologies in advance for the picture spam. I couldn't resist - I really enjoyed this mani! It might be a bit much for some but hey nail art to me should be FUN! I used 2 coats of Models Own Pure Purple (a gorgeous dark purple creme gifted to me from Christina!) onto half of each nail. I alternated the positioning of the purple on each nail and then filled in the rest of each nail with OPI Red My Fortune Cookie using a nail art brush. I then used Kiss nail art paint striper in white to freehand a vertical line where the 2 colours met. For the splatter/yolk, I dropped a large blob (such a technical word HAHA) of China Glaze Happy Go Lucky onto the middle of each nail and dragged it out quickly using a small dotting tool. I then added some random dots with the dotting tool around the splat. Pure Purple is such a gorgeous shade however it's a blurple so it was ridiculously hard trying to capture the colour properly. It's a dark purple but isn't as dark as it looks in my pics. What do you think? Does it remind you of Creme Eggs? Thanks for looking as always! Don't forget to enter my Hello Kitty Cosmetics giveaway here! Thank you Em!! ^_^ All thanks to awesome Cadbury for creating these delicious little eggs haha. You NEED to try them - and quickly too as they only hang around for a little while! Cheers Beccy! I had to rummage through all my reds to find the closest one haha. Took a while! 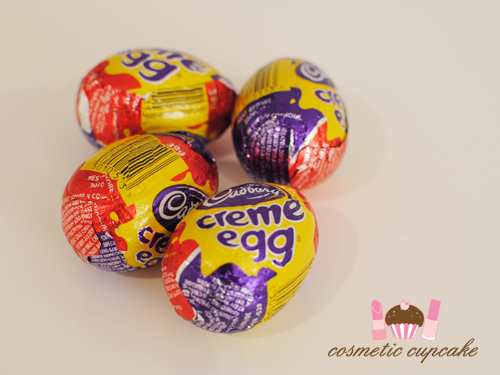 Have you eaten your creme eggs yet??! LOL it seems like I caused a few people to crave creme eggs! Luckily I didn't show the innards of one in my post then lol. Glad you like it Allie! Woohoo another creme egg lover! 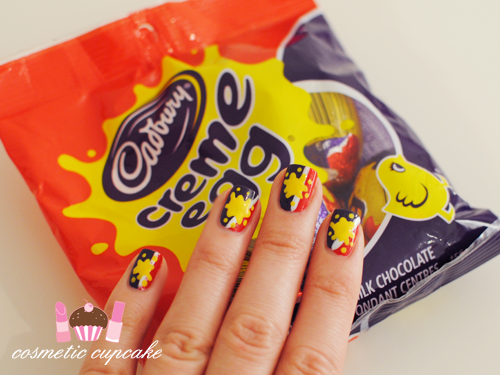 I don't know what creme eggs are (just saw them on your pictures) but I love your nailart! This is so cool, I wish I had the patience and skill to do something like this! It wasn't all that tricky to be honest but I did have to be careful. I had to redo a nail or 2 because I wasn't concentrating doh! Thanks Sarah! Yay for another creme egg lover. 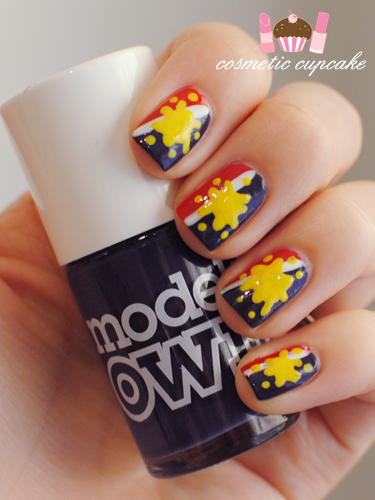 I had LOTS of fun doing this mani =) eating the inspiration too HAHA! Happy Easter to you too hun! I hope you got your chocolate fix! Happy Easter to you too lovely! Cadbury eggs are my favorite sweet ever! Although they don't sell them in bags like that in America, only singly or in packs of four. And the foil is different! They're so delicious. I eat an embarrassing amount between February and April. LOL you gotta enjoy them while they're in stores I say! Interesting to hear they are packaged differently in the States.. Love the little differences between the countries hehe. Makes it so much more interesting! Consider it a guilt free version of creme eggs lol. Happy Easter to you too! Lol oops x) Hope you got your creme egg fix! Oh my, these are amazing!! I also love Creme Eggs, have a packet in my fridge atm! 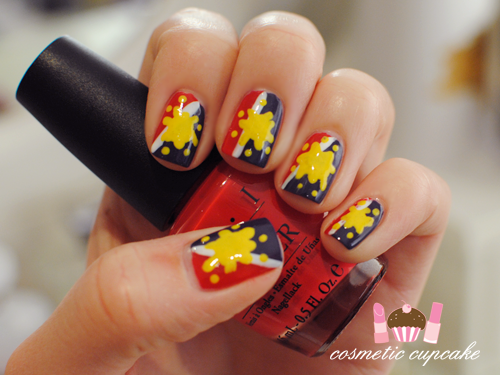 When I first looked, it looked like a Philippines flag design. But I looked closer. Much better than the flag, lol! I have to admit I have never tried Cadbury eggs, so this is so tempting. Now time to search for some. Awesome skills and manicure!! I love it. Plus your nail shape is simply ah-mazing! These are so cute. Love them! Great easter nails. 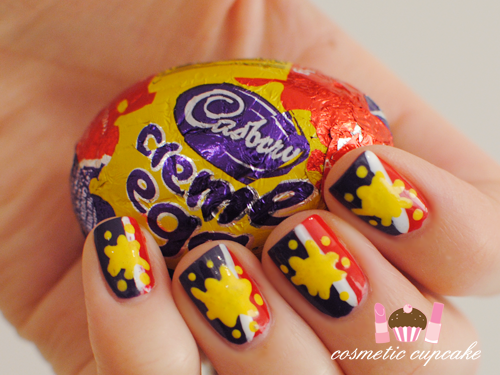 Too freaking cool, i love this :) now i want a creme egg as well, must go buy a couple tomorrow. OMG i just love it! 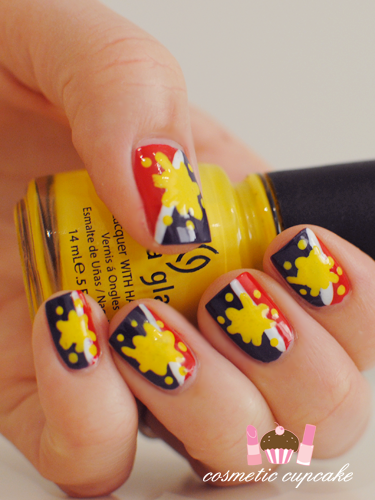 i do not want to show my daughter as she will want her nails like this for sunday i think she may just give you a run for your money when it comes to how much she loves those little eggs!!! Ooooh you're making me crave Cadbury Creme Eggs now! Your manicure looks awesome! Oh no! You "stole" my Easter manicure!!!! 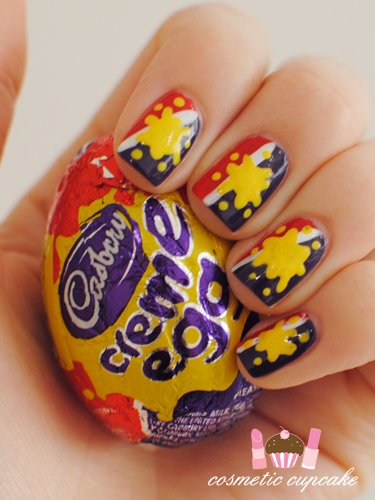 :P I have done one also inspired in my favourite Easter Eggs of all time... Creme Eggs by Cadbury!!!!!!!! I travelled recently and I was able to find those eggs in one of the portuguese islands (Madeira). I was very sad to only buy 3 but they were somewhat expensive. I really like your manicure and the eggs! Have a nice Easter! I love the effort you've gone to - It looks great! Hello Kitty Cosmetics giveaway winners!